squeeze style rolling ball.. clever design, f*ckin' CLEVER! i just got this today and omg i fell in love with it!! yo its not even hard to use, i swear the first tag i did came out perfect. i don't know what that kid's on, half way used till he got the hang of it!?? how can it take that long? how many sh*tty tags till you got it?? when you use this baby, keep the same squeeze pressure and write semi slow but consistent, don't press too hard, remember you gotta let the ball roll and don't think too hard homie, lol just write. anyways its the sh*t for me and i recommend everyone to try one cuz i didn't think much of it at first, even when i saw the videos for it.. you just have to try it, i mean its krink, that should be enough to convince you. One of the best mop or pen type markers I've used. Takes a little getting used to because you can go from uber thin to fat and drippy with just a little squeeze. 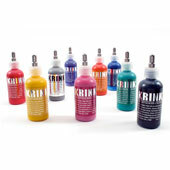 Krink is good, juicy stuff. Sorry Art Primo, I was forced to order these from Bombing Science since they had a pink K-66. I am very happy with it, its great for small tags. And yes, it can drip if you squeeze it enough. Its great for just about any surface. I have yet to encounter any problems like a few people below have mentioned. can you make these things drip??? or are they like a big ball point pen?? ?